As the country prepares for the holiday season, on November 23rd 7-11PM New Yorkers will be giving back in Brooklyn at The Batey 106 Benefit Concert at Cameo Gallery (93 N 6th St, Brooklyn, NY 11211). 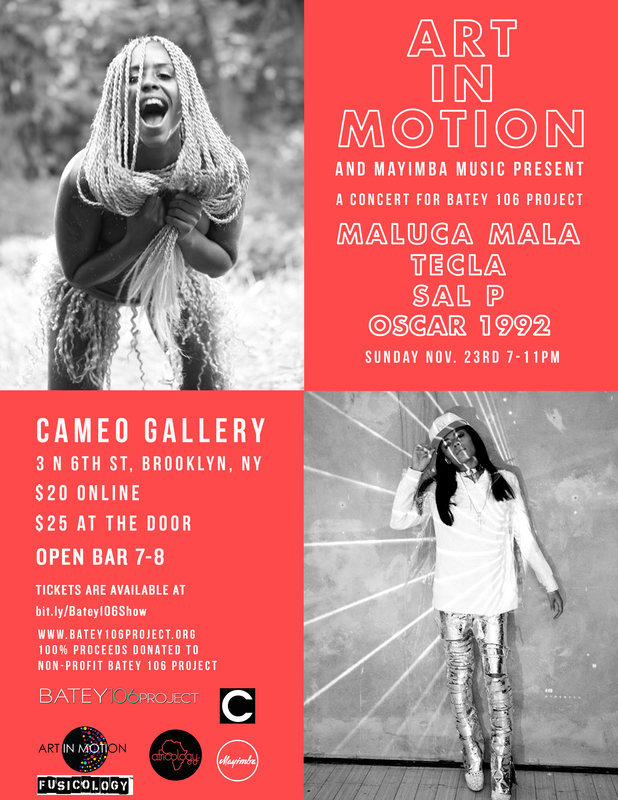 Mayimba has partnered with The Foundation for Art in Motion (AIM) and some of NYC’s brightest talents for an evening of music and solidarity at Cameo Gallery. 100% of the proceeds from the benefit will help fund a two week intensive arts program for the Haitian immigrants and children residing in the Batey 106 community in La Romana, Dominican Republic. Style Icon and recording star, Maluca Mala, Mayimba Music recording artist TECLA, DJ Sal P of Liquid Liquid fame, Oscar 1992 and others have donated their time and talent to this incredible program that will soon be developed for expansion all over the world. Discounted tickets can be purchased in advance here. For two weeks in December 2014, AIM will continue their series of art, music, photography, filmmaking, and mural workshops created for the children, teens, and young adults of the Batey 106 community. Led by artists/ filmmakers Monica Watkins, Emmanuel Alexandre Jr., and Theo Johnson along with photographer Erica Simone and musicians Maluca Mala and Omar Perez-Then. As part of the initiative, Art in Motion also provides meals for everyone attending the workshops – this includes children and their parents. The joint workshops have created strong creative bonds between families. While in the DR, Maluca Mala will record an original song with the children while teaching her singer/songwriter course which will be released by Mayimba Music and sold on iTunes as a fundraiser for the community. Batey 106 Projectʼs goal, ultimately, is to empower using the arts, music, photography and filmmaking as a tool to cultivate creativity. To learn more about The Foundation of Art in Motion & The Batey 106 Project click here & here. Brooklyn bands, DJ/ Producers and comedians have a home base in the form of kaleidoscopic arts hub, hidden in the back of a restaurant. The restaurant plays gracious cohost to the live music venue/ night club, dedicated to the fresh sounds coming out of brooklyn’s indie rock and electronic music scene. The casual air coloring Cameo’s spacious and edgy gallery is a fresh alternative to New York’s local scene, and the venue’s sky-high ceilings allow for the sort of natural, Spector-sized reverb that haunts aspiring rockers’ and DJs dreams. The venue resembles a black box but functions as a high-design soundstage, providing an ideal showcase for local talents and special events/ parties.